Dead circuit testing is testing performed with the power disconnected from the circuit. The main benefit of disconnecting power supply while tests with an external energy source are performed is to eliminate hazardous risks to the environment or the person conducting the test. 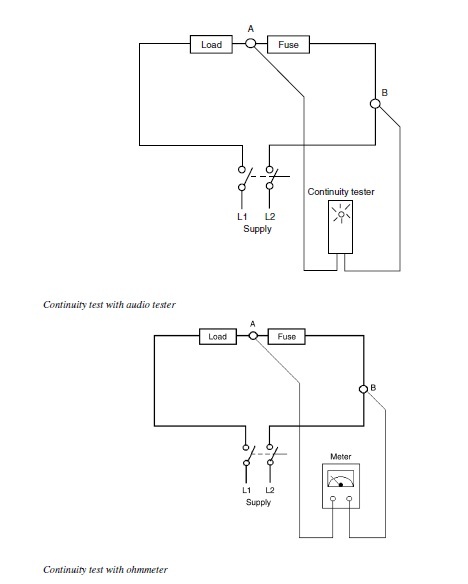 A continuity test, as well as, an insulation test can be performed in the dead circuit test. This is to be performed on a dead circuit for checking continuity. Using an ‘Audible Continuity Tester’ can do it. 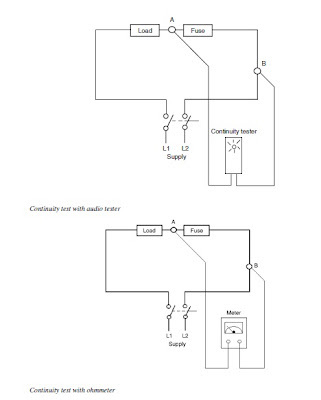 This tester consists of a battery as a source of energy, an audible device, and two test leads. By this test, the continuity of an electrical circuit is checked to ensure that the electrical path is complete. If the path is continuous, then an audio sound is emitted to confirm path continuity and the non-existence of an open circuit. In some devices, along with the audio indication, an LED or some other visual indication is provided. Similarly, an ohmmeter or multimeter can also be used to check continuity. An ohmmeter or multimeter consists of a battery as a source of energy, along with a meter to display the value of resistance. In an ohmmeter, the scale is calibrated from zero to an infinite range of resistance. When the meter shows a zero reading, it indicates that the path between two test leads has zero resistance. This, in turn, indicates that the path is a continuous one. If the path or the conductor is open, then it will show resistance value as infinite. 􀀹 Integrity of switches, fuses, and other devices. A few words of caution are warranted here. Checking for continuity in a control circuit can give erratic results due to the existence of parallel circuits. It is better to disconnect appropriate terminals to ensure correct results. Continuity test in power circuits can be tricky. Often, a circuit where there is an open circuit fault can register excellent continuity with a low power tester or ohmmeter. But when a voltage is applied, current may not flow. The reason for this is that the circuit may be partially continuous (Example: a partially burnt cable where one or two conductor strands may be making contact) but when feeding a heavy load it will behave as a high impedance.